Winchester, NH remembers Keyton Marrotte who was killed after being hit while sledding. 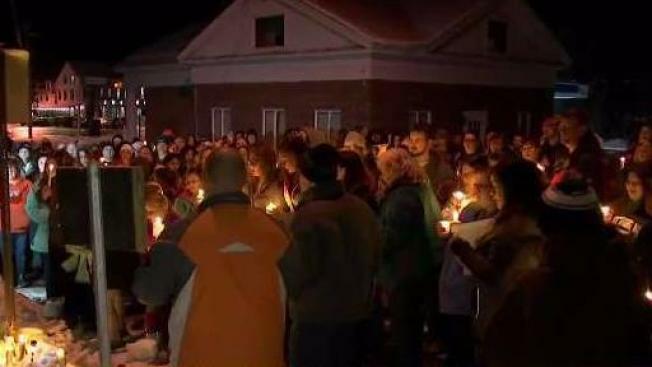 A New Hampshire community came together Monday night to mourn the loss of a 10-year-old boy after he was struck by a vehicle while sledding behind his home in Winchester on Saturday. Several people came out to remember 10-year-old Keyton Marrotte at the scene of what is being called a freak accident. People at the service remembered Marrotte as a person who was committed to his Christian faith and also to helping others. On Saturday, Marrotte had been sledding down a hill behind his home on Michigan Street just before 3 p.m Saturday. Police said when Marrotte reached the bottom of the hill, he continued onto the street and was struck by a vehicle. A woman who did not see the accident but heard it, ran to the scene and immediately began CPR on the boy. Emergency personnel then arrived on scene and continued lifesaving efforts which were continued by medical personnel while en route to Cheshire Medical Center where Marrotte later died. Police say that the driver who struck Marrotte will not face charges.